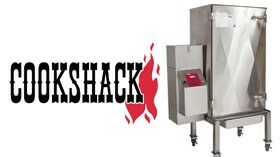 Looking for a Cookshack Smoker? Using a Cookshack smoker is easy and you'll get amazing results every time. Simply place a small pile of wood in the smoker box, load the meat, insert the meat probe, shut the door, set the temperature with the digital controller and leave it alone until you are ready to eat! Clean up is a snap. Grills and racks go straight into the dishwasher. Drippings are contained in the stainless steel drip pan. Interested in smoking more than just meats? Imagine smoking your own gouda, mozzarella, or cheddar. Or how about some lox-style salmon? You can do this in your Cookshack Smokette Elite, Super Smoker Elite, or AmeriQue with a simple cold smoke baffle made just for your smoker.